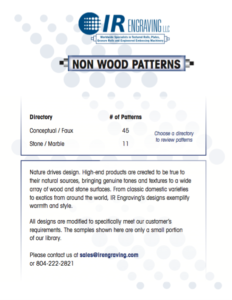 Our full catalog of patterns includes Natural Grains, Geometric, Metal, Wood, Stone / Marble, Fabric, and Decorative patterns with hundreds of samples. Nature drives design. 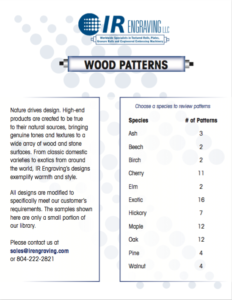 High-end products are created to be true to their natural sources, bringing genuine tones and textures to a wide array of wood and stone surfaces. From classic domestic varieties to exotics from around the world, IR Engraving’s designs exemplify warmth and style. 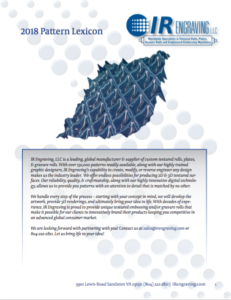 All designs are modified to specifically meet our customer’s requirements. The samples shown here are only a small portion of our library.